Easykit para montar SEM COLA! Só encaixes! Já vem pintado! The Tornado was developed and built as a two-seat multi-role combat aircraft by Great Britain, Italy and Germany in collaboration. 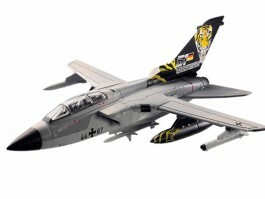 The Tornado IDS was supplied from 1981 onwards to the German air force and navy flying units. In total the air force received 212 and the navy 112 of the Tornado IDS.For kids and beginners of scale modeling!